I just doodled this just now and took a shot with a camera. I started this with the eyes (so random -_-) that something just came out. 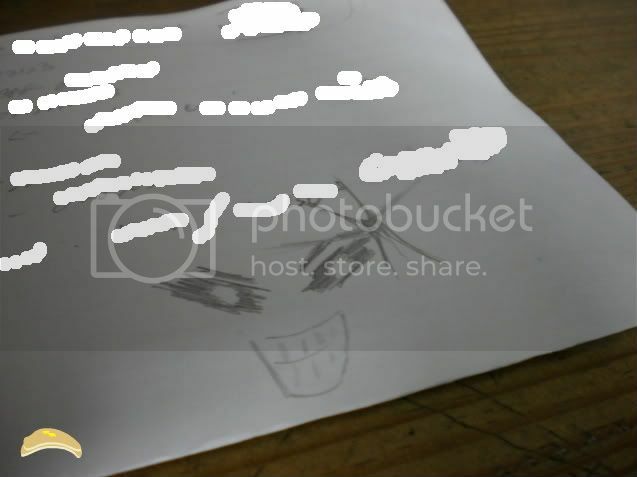 Sorry about the blanks in the photo, it’s just I drew randomly so the paper contains some information that I can’t say. This work by Amaya Lim is licensed under a Creative Commons Attribution-Noncommercial-No Derivative Works 2.5 Malaysia License. © Amaya Lim and Espressivo – Amaya Lim, 2009. Unauthorized use and/or duplication of any material without express and written permission from this blog’s author and/or owner is strictly prohibited. Excerpts and links may be used, provided that full and clear credit is given to Amaya Lim and Espressivo – Amaya Lim with appropriate and specific direction to the original content.